Winter is the time many people start to notice spider mites on houseplants. The dry, indoor air and reduced plant vigor seem to favor the mites. Start checking now to avoid bigger losses later. Twospotted spider mites feed externally on the foliage of nearly all houseplants, though some, such as ivy and Norfolk Island pine seem particularly susceptible. Spider mites use piercing-sucking mouthparts to puncture the plant tissue and feed on the liquid within the cells. In light infestations the foliage will appear to be speckled with very tiny yellowish-green spots. Heavy mite infestations can turn the foliage to greenish-yellow and eventually tan or brown. Heavily infested plants often drop their leaves. Close examination of infested foliage may reveal very fine webbing produced by the mites on the leaves and stems. The first step in spider mite control on houseplants is to inspect regularly and frequently for pests. Look closely. Spider mites are tiny and may be difficult to see with the naked eye. If mites are present, the next step is to determine the extent of the damage and the value of the plant. It is usually easier, quicker and more convenient to discard a small plant that is heavily infested than it is to return it to good health and appearance. If possible, prune heavily infested portions of larger plants before attempting mite control. 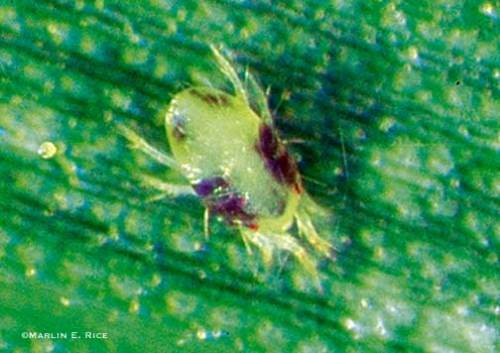 Washing or syringing infested plant foliage may reduce light mite populations. Move plants outdoors or into the bathtub or shower and then use a forceful spray of water to dislodge mites from an infested plant. Several miticides (pesticides that control mites) are available for houseplants. Check with your local nursery or garden center. Read and follow all the label instructions. Keep plants watered and fertilized to promote health and vigor and to reduce the impact of mite feeding. We no longer advise use of ordinary dishwashing detergent in place of commercial insecticidal soap products. "New and improved" and concentrated liquid detergents with "grease cutters" and other ingredients have a high potential for being harmful to the plants. For more on insecticidal soaps, see the ISU Extension Garden Column for November 23, 2007. Twospotted Spider Mite. Photo by Marlin Rice, published in Integrated Crop Management Newsletter, July 10, 2006. Links to this article are strongly encouraged, and this article may be republished without further permission if published as written and if credit is given to the author, Horticulture and Home Pest News, and Iowa State University Extension and Outreach. If this article is to be used in any other manner, permission from the author is required. This article was originally published on December 5, 2007. The information contained within may not be the most current and accurate depending on when it is accessed. How can I determine if my houseplant has spider mites? How do I control spider mites on houseplants?